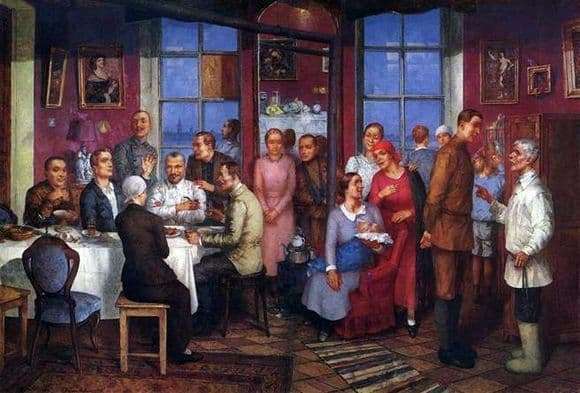 The concept of Kuzma Petrov-Vodkin was extremely simple and realistic: the end of the Civil War of the beginning of the 20th century, the distribution to the workers-workers and the military apartments, formerly owned by bourgeois. One of these apartments, received by a young man sitting at the table with a pipe in his hands. Housewarming. Consider some particularly important fragments of the canvas. To the right of the new owner is a man who raised his hand. This is the main storyteller. Notice, not the owner, not his settlement is discussed, but some experiences and stories of a man with a raised hand. Outside the window, the Peter and Paul Fortress is clearly visible, which means that this is an elite dwelling, because it stands on the Palace Embankment. However, can a poor cottage be a bourgeois?! Near the stove, on which the kettle is heated (and what you wanted, the war has just ended, many more and many works await the restoration of normal life, for example, inserting glass instead of plywood over the young man’s head at the window), stands a former war veteran but with a broken arm, and a modest woman in a pink dress stands side by side. They retired, despite being in society, and cooing. A nursing mother sitting by the stove is an obvious reference to Madonna, no matter what artist – anyone! There are several comparisons in the picture of the rich device of the former owner and the unpretentious life of the present: an expensive chair (empty, by the way!) And a wooden stool; good carpet and a small cheap rug; chic paintings in gilded frames and a poor table (in the sense of – food) on the occasion of the holiday; a huge luxurious pierum, intersected almost by a rusty pipe. In the upper right corner hangs an empty frame. In fact, this is a salary, only icons there are no longer provided for by a new system.